Stop being captive of online ordering platforms that take you huge commissions. With TapPublisher, you pay zero commissions on orders and you increase your margin. 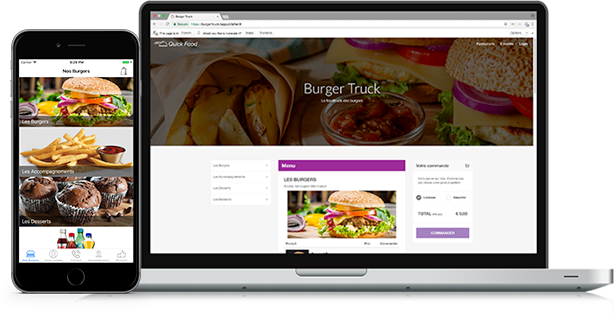 With your online ordering site and your mobile app, your customers can browse your menus & specialties, order, choose their delivery method and pay securely. Do not miss a single sale to take away or deliver. Create a loyalty program and promo codes. An happy customer will come back and order more often. With TapPublisher, you own the client listing. Give your customers the opportunity to order directly in just a few clicks. Your online ordering site is customizable and optimized to provide a simple, fast and efficient experience. Your mobile app for iPhone and Android will keep you in touch with your customers at all times. Besoin de plus d’informations ? Besoin d’une démo pour sauter le pas ? Pour être conseillé ou pour une démonstration de notre solution de création de site Internet et de gestion du référencement local, n'hésitez pas à contacter un de nos experts.